"Kingdom and Repentance," "Fishing for Humans," "In Capernaum's Synagogue," "To Other Places," The Jesus Database, an online annotated inventory of the traditions concerning the life and teachings of Jesus. Dr. Gregory C. Jenks, FaithFutures Foundation. Commentary on a Harmony of the Evangelists, John Calvin, 1558: Matthew 4:12, 17/Mark 1:14-15, Luke 3:19-20/Luke 4:14-15, Matthew 4:13-16, Matthew 4:18-25/Mark 1:16-20/Luke 5:1-11. "Christ, thinking that he would eventually depart from us, even at the beginning of his preaching gets himself disciples of a heavenly sort, poor and unlearned, and therefore such as might be left as honest witnesses of the truth of those things which they heard and saw." "He went not to Herod's court, not to Jerusalem, among the chief priests and the elders, but to the sea of Galilee, among the fishermen. The same power which called Peter and Andrew, could have wrought upon Annas and Caiaphas, for with God nothing is impossible. But Christ chooses the foolish things of the world to confound the wise." "Although it is the peculiar business of Christ to establish the kingdom of heaven in the hearts of men, yet it is observable, he begins his preaching in the same words with John the Baptist: because the repentance which John taught still was, and ever will be, the necessary preparation for that inward kingdom." "Christ's First and Last Subject," Luke 24:47; Matthew 4:17, Charles H. Spurgeon, 1860. "Our Lord sometimes speaks of the new kingdom as already come--in His own Person and ministry; but the economy of it was only "at hand" until the blood of the cross was shed, and the Spirit on the day of Pentecost opened the fountain for sin and for uncleanness to the world at large." "They obeyed at once. Thus Christ ought always to be obeyed. No excuses for delay were offered, or should ever be." Commentary, Matthew 4:12-23, Warren Carter, Preaching This Week, WorkingPreacher.org, 2017. "This rich passage comprises four subscenes as the Gospel positions Jesus in Galilee (Matthew 4:12-16) and narrates the opening acts of Jesus' public activity (Matthew 4:17-23)." "Being Before Doing," David Lose, ...in the Meantime, 2017. "Lectionary Greek," Rob Myallis, 2017. "Left Behind," Melissa Bane Sevier, Contemplative Viewfinder, 2017. "The Politics of Inauguration and Surrender," Fritz Wendt, Political Theology Today, 2017. "The nature of Jesus' final temptation sets the stage for Matthew's introduction of Jesus' ministry in Galilee. Several aspects of Matthew's version of this part of the story stand out." "Mapping God's Promises," Karoline Lewis, Working Preacher, 2017. "Following Jesus: That For Which We Are Made," Janet Hunt, Dancing with the Word, 2017. Evangelio Comentario, J. Manny Santiago, Working Preacher, 2017. "Gasping for air in the kingdom," Andrew Prior, One Man's Web, 2017. "Jesus' Inauguration," Glenn Monson, Law and Gospel Everywhere, 2017. Commentary, Matthew 4:12-23, Judith Jones, Preaching This Week, WorkingPreacher.org, 2014. "Jesus’ ministry begins after his temptation, with the news of John’s arrest." "Fishers of People," David Lose, Dear Working Preacher, 2014. "My theme in a nutshell: Jesus called ordinary people right in the middle of their ordinary lives to do extraordinary things … and he still does." "All In," Alyce M. McKenzie, Edgy Exegesis, 2014. "To be a disciple means to go all in for a ministry to the least and the lost. We don't get to choose who is worthy of Jesus' attention, of receiving the Messiah's light." "The Reason of Following," D Mark Davis, Left Behind and Loving It, 2014. "Epic Fail?" David J. Lose, Question the Text, 2014. "So given these apparent blunders and bad choices, my question is, 'Did Jesus just plain want to fail?'" "A Thousand Tongues," Nancy Rockwell, The Bite in the Apple, 2014. "Truthful tales always have an equal measure of pain and joy." "Carrying On the Kingdom Mission," Bob Cornwall, Ponderings on a Faith Journey, 2014. "Nest or Nets?" Peter Woods, The Listening Hermit, 2014. "Accept the Consequences," Suzanne Guthrie, At the Edge of the Enclosure, 2014. "A Workaday Gospel," Rick Fry, 2014. "A Little Light to See," Alan Brehm,The Waking Dreamer. "We have to reckon with the fact that light doesn't always dispel the darkness, but it dispels the fear of darkness. In the same way, God's presence doesn't always change the circumstances that create fear. But God's presence does lift the fear itself and remind us that whatever we may have to suffer in this life is not the ultimate truth of our lives. " "Walking around in the Dark," Janet H. Hunt, Dancing with the Word, 2014. "How have you grown accustomed to 'walking around in the dark?'" "You Gotta Serve Somebody," Andrew Prior, 2014. Comentario por Elizabeth Gareca Gareca, Working Preacher, 2014. Commentary, Matthew 4:12-23, Eric Barreto, Preaching This Week, WorkingPreacher.org, 2011. "For the third time in Matthew, Jesus finds himself embracing a new hometown." Commentary, Matthew 4:12-23, Audrey West, Preaching This Week, WorkingPreacher.org, 2008. Comments (commentary) and Clippings (technical notes for in-depth study), Epiphany 3, Chris Haslam, Anglican Diocese of Montreal. Jesus Calls the First Disciples, audio telling, story in episodes, graphic, audio and written commentaries. Go Tell Communications, Biblical Storytelling for the Global Village, 2011. Lectionary Blogging, Epiphany 3, John Petty, Progressive Involvement, 2011. "This 'new community' is not based on family or economic ties--quite the contrary, in fact; its first four members left their families and their boat. The new community is the one based in Jesus." "Snap Decisions are the Best Kind," Alyce McKenzie, Patheos, 2011. "Maybe snap decisions aren't as snap as we think. Every decision takes place in a context." "Out of Nowhere," Russell Rathbun, The Hardest Question, 2011. "Why does the incarnation of the word of God not start in Jerusalem, but instead begins out in the Gentile countryside? " "First Thoughts on Year A Gospel Passages in the Lectionary: Epiphany 3," William Loader, Murdoch University, Uniting Church in Australia. "It is not scalp hunting but seeking out people to follow, in the way that Jesus has sought out the disciples, engaging them in the vision and agenda of the kingdom which will widen their horizons taking them into dark and unfamiliar places, but with light and compassion." Dylan's Lectionary Blog, Epiphany 3, 2005. Biblical Scholar Sarah Dylan Breuer looks at readings for the coming Sunday in the lectionary of the Episcopal Church. "Becoming a "fisher for people" is going to bring these Galilean fishers not only into relationship with Jesus, but into a whole new network of relationships with others. Their relationship with Herod Antipas and the powers of this world, with the hated toll collectors, with their neighbors, with their families, with Gentiles and Pharisees, with anyone who hears Jesus' call and, responding to it, becomes a sister or brother ... none of these will ever be the same." "What should be our response to the coming of heaven's rule? Surprisingly, it is not worship or praise, but repentance." Holy Textures, Understanding the Bible in its own time and in ours, Matthew 4:12-23, David Ewart, 2011. "The command / invitation to Peter, Andrew, James and John to 'Come, follow me,' is not: 'I wonder if you would consider the possibility of tagging along if you have the time, and it's not too inconvenient.'" "Third Sunday after Epiphany: Matthew 4:12-23," Revelation and Response: Matthean Texts for Christmas and Epiphany, Carol Mork, Word & World: Theology for Christian Ministry, Luther Northwestern Theological School, 1989. Wellspring of the Gospel, Ordinary 3A, Catherine McElhinney and Kathryn Turner, Weekly Wellsprings. "Light Has Dawned," Rev. Bryan Findlayson, Lectionary Bible Studies and Sermons, Pumpkin Cottage Ministry Resources. Includes detailed textual notes. "The Call to Adventure (Matthew 4:17-22)," John C. Purdy. Chapter 2 of Returning God's Call: The Challenge of Christian Living. At Religion Online. "Wherever the church allows "the kingdom of heaven is at hand" to be separated from Jesus' call to working people to follow him, the game is up. The vital nerve of the Christian movement has been severed." "Being Whole Rather than Cured," Fr. Gerry Pierse, C.Ss.R., from Sundays Into Silence: Reflections on the Sunday Gospels in the Light of Christian Meditation. Claretian Publications. "Meditation is a form of prayer that asks us to follow Christ by letting go of all." "A Light to the Nations," Larry Broding's Word-Sunday.Com: A Catholic Resource for This Sunday's Gospel. Adult Study, Children's Story, Family Activity, Support Materials. "Who do you know that is wise? Who truly 'enlightens' you?" "A Calculated Withdrawal," Expository Essay, Bill Long. Part 2. "Capernaum," "Calling the Disciples," wikipedia. "The Galilean Fishing Economy and the Jesus Tradition," by K.C. Hanson. "I employ a model of embedded economics to articulate the relationships between the various players in the sub-system: the Roman emperors; Herod Antipas; the tax administrators; the brokers, tax collectors, and toll collectors; the fishing families; the hired laborers; the suppliers of raw goods and other products; fish processors; and shippers and carters." Fishing in the NT- A Misunderstood Analogy for Evangelism by Daniel B. Wallace at the Biblical Studies Foundation. "The imagery has nothing to do with 'hooking' the unbeliever with the gospel. Further, the picture is not individualistic: the point is not one person being reeled in at a time. All of this has to do with line-fishing, but this is not the picture seen in this text." Bynum, Peter, "Between Text and Sermon: Matthew 4:12-23," Interpretation, 2013. Carter, Warren, "Matthew and the Gentiles: Individual Conversion and/or Systemic Transformation," Journal for the Study of the New Testament, 2004. Carter, Warren, "Matthew 4:18-22 and Matthean Discipleship: An Audience-Oriented Perspective," The Catholic Biblical Quarterly, 1997. Carter, Warren, "Narrative/Literary Approaches to Matthean Theology: The 'Reign of the Heavens' as an Example (Mt. 4:17-5:12)," Journal for the Study of the New Testament, 1997. Craddock, Fred B., "Fleeing before Herod," The Christian Century, 1990. Goulder, Michael, "Two Significant Minor Agreements (Mat. 4:13 Par. ; Mat 26:67-68 Par. )," Novum Testamentum, 2003. Hall, T. Hartley, "An Exposition of Matthew 4:12-23," Interpretation, 1975. Ralls, Mark, "What About Zebedee?" The Christian Century, 2005. Senior, Donald, C.P., "Between Two Worlds: Gentile and Jewish Christians in Matthew's Gospel," The Catholic Biblical Quarterly, 1999. Shedinger, Robert F., "Must the Greek Text Always Be Preferred? Versional and Patristic Witnesses to the Text of Matthew 4:16," Journal of Biblical Literature, 2004. Willard, Dallas, "How To Be a Disciple," The Christian Century, 1998. "The World Will Turn," Stephanie Spellers, Day1, 2017. "Cobwebs on the Confessional," the Rev. Dr. William L. Self, Day 1, 2008. "Follow Me, and I Will Make You Go Fishing," the Very Rev. Samuel G. Candler, Day 1, 2005. "Walk in the Light," the Rev. Michael J. Fish, Day 1, 1999. Worshiping with Children, Epiphany 3, Including children in the congregation's worship, using the Revised Common Lectionary, Carolyn C. Brown, 2014. 2011. "Storypath Lectionary Links: Connecting Children's Literature with our Faith Story," January 26, 2014, Union Presbyterian Seminary. Connections: Matthew 4:12-23 and Library Lion by Michelle Knudsen. 2011. "Going Fishing," Charles Kirkpatrick, Sermons4kids.com. Gospel Puzzles for the Lectionary, Matthew 4:12-23, Mark Ryman, edoxy.com. Fishing for People Dot-to-Dot, Fishing for People Wordsearch, sermons4kids.com. 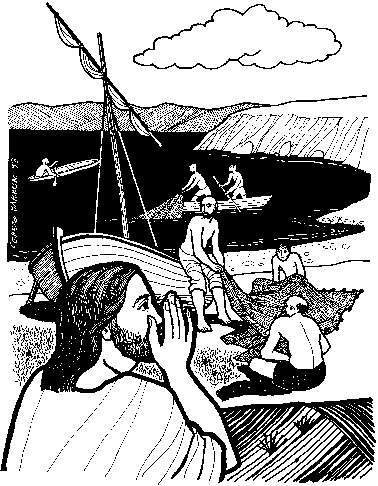 "Jesus Preaches in Galilee," online computer java-based coloring pages from Grace Baptist Church of Feeding Hill. "Towards the Galilee of the Gentiles," "The First Five," from A Certain Jesus by Jose Ignacio and Maria Lopez Vigil. Ideal for catechetical and liturgical dramatization of today's gospel. Claretian Publications. Clip Art, Matthew 4:17, Matthew 4:20, Fr. Richard Lonsdale, Resources for Catholic Educators. Clip Art Images: Matthew 4:12-23, Misioneros Del Sagrado Corazón en el Perú. Matthew 4:12-23, at Cerezo Barredo's weekly gospel illustration. Liberation emphasis. Peter and Andrew, Henry Martin, sermons4kids.com. Hymns with Scripture Allusions: Matthew 4:19, 23. The Cyber Hymnal. "The Lamb's Embrace," TEXT: Mark Ryman (2005) based on Matthew 4:12-23. TUNE: "Monkland." New Hymns for the Lectionary.